May is the month when we start seeing the average wind velocities drop on coastal waters. It also is a month when the surf turns on for the first time each year. Old timers on the fishing scene, who love surf fishing, usually wait until May to get excited about fishing the beachfront. By Mother’s Day Weekend, the water temperature is usually pushing 80 degrees and the surf is ripe for wade fishing. While May is the month, it is not a time when the surf produces continuously. At some point during the month we almost always have one of the last of the winter cold fronts pass through and following its passage will be light northerly winds that flatten the surf. It is during those May events that some of the best surf fishing of the year takes place. During this time, the water is warm enough to wade fish without insulated waders and the action tends to be “off of the charts” as one seasoned surf fishing guide described it. For the purpose of those who are either new to coastal surf fishing or have had limited experience on this topic, we will attempt to give some pointers and recommendations that will enhance your chances to have a successful fishing experience. 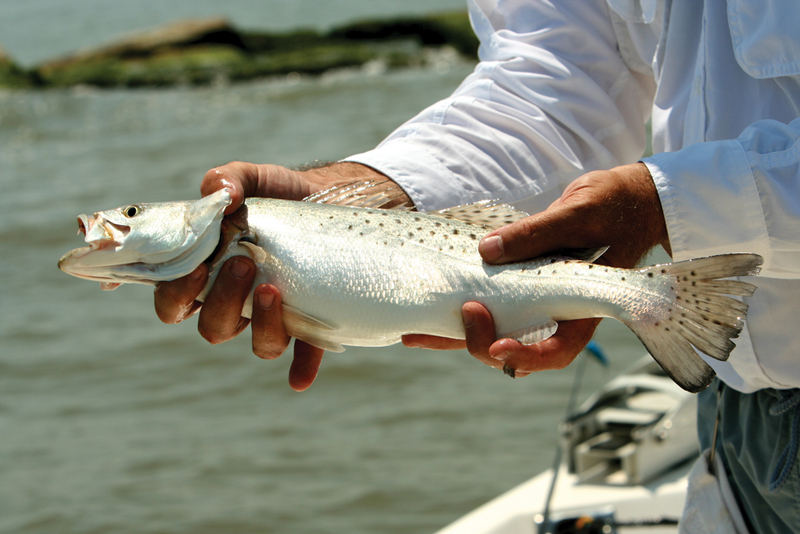 There is an old adage that says 10% of the fishermen catch 90% of the fish. Well, there is a reason for this, especially when it applies to surf fishing. Some of the key elements that affect success in the surf are wind direction and velocity, ability to predict when good fishing conditions will arise and knowing the baits and how to fish them. Often, there will be pictures in the paper showing heavy stringers of fish being hauled in by wade fishermen in the surf. Those individuals most likely did not rely on pot luck for their catch but their ability to predict the window of excellent conditions that resulted in their success. Wind and its direction and velocity are most likely the key elements. When fishing the surf, it is most desirable to have a flat surf which results from a light northerly wind or light southeast breeze. When those ideal conditions arrive, seagulls, pelicans and other seabirds will be seen just beyond the wading areas working schools of jack crevalle, sharks and other predators chasing mullet and other bait. So, how does the average angler predict the arrival of such conditions? The first thing is to watch the forecasts. Following periods of strong southerly or easterly winds, there is usually an event that changes things. A mild cold front is one of the best. When that occurs, the beachfront and surf are usually calm for a short time. Once the calm waters set in, it does not take long for the water to clear. Tidal movement is a very important aspect, but not as important as good surf conditions. Now, when all of this comes together and presents that window of golden opportunity, how is the best way to take advantage of it? Wade fishing is the best option and the baits of choice are determined by whether your preference is natural (live) or artificial baits. Popping corks baited with live shrimp are probably the most popular and productive way of fishing the calm, May surf. Anglers often choose artificial baits due to the ease and convenience of not dealing with a live bait well hooked onto one’s waders and the need to keep the bait alive. Soft plastics and spoons, both silver and gold, are likely the most popular of the artificial baits. The choice is up to the angler and is usually based on individual preference and past success with a particular type of bait. Watch for those windows of excellent conditions and also be alert when in the water to keep your distance from schools of jumping mullet. Often those mullet are a sign of sharks feeding and a time when some of the rare shark bites occur along the upper Texas Coast.